You really should read this if you are in the market for a diamond engagement ring! The world is full of diamonds – some good, some bad, and some ugly. The “bad” and “ugly” description can apply to every diamond grade here, not just lower grade diamonds. Dodgy diamonds should be avoided at all costs and unless you are a diamond expert, you should seek the professional advice of a good jeweller. Dodgy diamonds, or diamonds that are “not quite right”, are plentiful. When you surf the web you will see thousands of diamonds listed for sale on websites. Any jeweller can provide these long lists of diamonds for sale on the worldwide market. These are not diamonds stocked by the jeweller and these lists are not screened in any way to eliminate the dodgy diamonds that are offered for sale. The trouble is that it is not easy to tell from these lists which is a good diamond and which is not, because the documentation (certification) accompanying the diamonds is limited in the detail it can provide. Below are two diamonds that have been given the same clarity grade (SI2) by the Gemological Institute of America (GIA). As you can see, this does not make them equal. I have highlighted the main inclusions in green for each diamond. A low end SI2. The same grade as the diamond above, but a poor example of the grade. 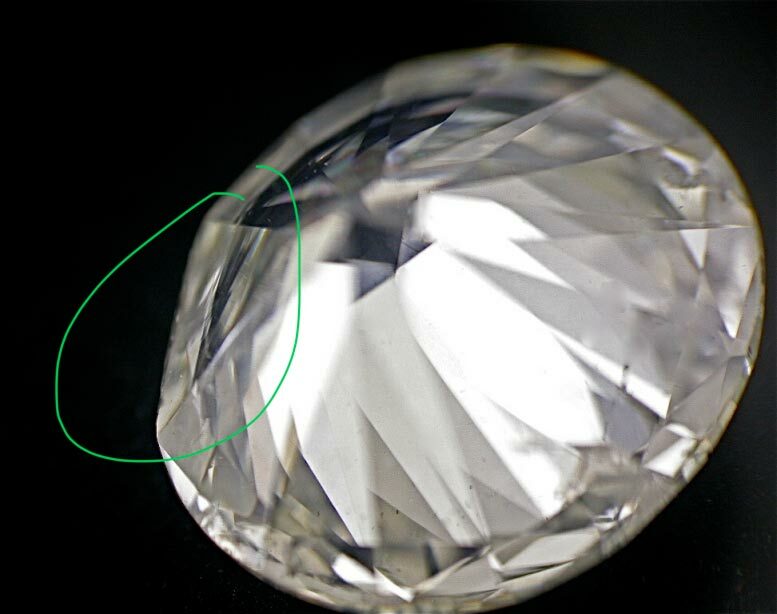 You can see in the second diamond, that the highlighted inclusions are not all the issues in the diamond. It is full of many, many inclusions, which will have an impact on the overall sparkle of the diamond. Just remember that the GIA has given both these diamonds the same clarity grade of SI2. It is just that the first is a great example of the grade, whilst the second is a low end SI2. In fact it borders on being the next level down (P1). Disparities can get even further apart than this if you include other certifying labs that have different standards to the GIA. The same great differences apply in the colour grading of diamonds. A Cheap Diamond For it’s Grade, but Would You Want It? Diamonds are all individual, and they are usually priced for what they are. Dodgy diamonds should cost less. So if you see a super cheap diamond for its grade, the first question you should ask is why? Two Diamonds are the Same Grade, but One is Much Cheaper than the Other. Why? In the photos above, you can see that the second diamond should be cheaper than the first, as it clearly is not as good as the first. It is easy for people in the diamond industry to advertise diamonds on the web that are the lowest cost diamonds in their grade. These are the poor examples of their grade and appear to be cheap as they have been given the same grading as better examples. For the unsuspecting consumer who lacks expertise in diamond grading, buying on price alone is very unwise. The cost for the “best in their grade” diamonds is higher, because they are just that – the best in that grade. Demand for the best diamonds within any grade level outstrips supply. Diamonds that fall within the low, “worst in their grade” end of the grade level are plentiful and cheap in comparison to the best in the grade diamonds. Buying with just the price in mind is fine for the easy stuff in life, but for things that are really important and expensive to put on your finger, like an engagement ring. . . I think you may just need to look past price for a moment. Dodgy diamonds should be avoided at all costs. You are really wasting your money if the diamond you end up with is not a great looking diamond. Dodgy diamonds are in all grades, it matters not what the grade level is. You simply can’t tell by looking at a list of diamonds, or even by looking at the certification on any particular diamond, what you are actually getting, unless you have years of experience or are a trained specialist in the grading of diamonds. Even with our expertise, we cannot, on the basis of the certification alone, determine what is a good diamond in any particular grade. We have longstanding relationships with our diamond cutters that have been established over many, many years of dealing in diamonds. We use our knowledge of the numerous issues diamonds can have, to ask our cutters pertinent questions about each diamond’s particular characteristics. This is how we sort the good from the bad and ugly. 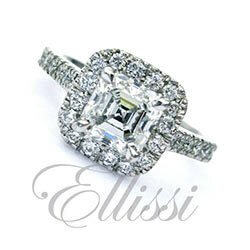 At Ellissi, we could also advertise lists of poor quality diamonds that are available from cutters as other websites do, but we choose not to as our reputation means more to us than supplying low cost, low quality diamonds. Diamond Certificates: What Can You Tell From the Plotting Diagram? The certification requested by cutters for diamonds under 1.00 ct in weight is usually a type of certification called a “Dossier report” that does not include a plotting diagram. Plotting diagrams map the inclusions within any given diamond. They provide detail of the inclusion type and the layout or position of the different inclusions. As dossier reports don’t come with plotting diagrams, sound guidance is critically important to knowing if the diamond fits the price and is a good example of its grade. Full Diamond Certification Reports come with plotting diagrams. Below are some plotting diagrams from GIA certification reports that range over three clarity grades, VS2 – SI2. Even though these certificates come with full plotting diagrams, this is not an indication on its own of how a diamond looks to the eye. This is why sound advice is needed. Can you tell which is the best, highest graded diamond from the plotting below? I’ll give you a tip, it is NOT the diamond at the bottom. Various plotting diagrams for different diamonds. You will be surprised to know that the diamond that was the highest grade was not the bottom one! What do Some of These Inclusions Actually Look Like? Dodgy diamonds really should be avoided. This is what they look like. It sure isn’t pretty. But then this diamond will (or should be) a low price compared to better diamonds in the same grade. Large Indented Natural Inclusion Running from the Diamond’s Girdle to the Pavilion. As it cannot be seen when the diamond is face up, it is not part of the clarity assessment. Avoiding Dodgy Diamonds: What if I Just Stick With the Very High Clarity Grades? Even in the highest diamond clarity grades you are not safe. These are diamonds that are pretty free of inclusions – nothing to worry about on that score. If the diamond were also D colour, the highest colour grade, then you would think “Hey this is as good as I can get, I can’t possibly go wrong” ( as long as you can afford the cost). Well, this is not always the case. High grades do not necessarily give you a guarantee that the diamond will look good or be of good quality. We often see very high clarity grades, internally flawless, VVS1 – VVS2 etc in diamonds offered by cutters. It sounds good until you look into the detail. It is the diamond cutter’s job to maximise the return from the original diamond crystal. Therefore, cutters will cut the diamond to a shape that will retain the most weight and will remove any surface marks and inclusions so as to enhance or raise the diamond’s clarity grade. This will give the diamond a higher “score” on the certification accompanying the diamond. However, this can result in diamonds that exhibit very poor light refraction (sparkle). This, in combination with a poor cut shape means that the overall look of the diamond can be very dull. On the face of it you would think this is a great diamond . . . but this is just not necessarily the case and quite often, if the cost is low, you should be questioning why. Just remember, dodgy diamonds are abundant in the market place! This next diamond (see below) has a large section removed on the underside. It has in all likelihood been cut in this way to remove some large inclusions. This has been done in order to raise the diamond’s clarity grade three or four places higher up on the scale. As you can see in the second image, the diamond has a rough girdle edge. The cutter has done this in order to retain as much of the diamond’s weight as possible. It is no doubt a better grade now than it would have been had the inclusions not been removed, but would you really want this at VS2 ? It would be better to have a nicer cut in a lesser grade. A rough girdle such as this can affect the look of a diamond, especially in fancy cut diamonds where it reflects through the stone, making it appear dull. A large section of this diamond has been cut out in order to achieve a higher clarity grade. This will have a significant visual impact on the diamond. In fancy shape diamonds (any shape that is not round brilliant), cutting to remove inclusions and retain size is very problematic. It gives rise to a myriad of issues, such as: very deep or very shallow cut diamonds; misshapen cuts; extra facets; uneven girdles, and I could go on and on. All these issues are completely unrelated to the colour and clarity of the diamond. The diamond could have the highest possible grading (D/FL), but still be a poor looking diamond. Just knowing about the existence and having some understanding of the 4 C’s ( Carat, Clarity, Colour and Cut ) is far from having it covered when you are doing your research. Without any training and knowledge of the myriad of other issues with diamonds, saying you know about the 4C’s and therefore you know what you are doing, is like saying “I know the alphabet A-Z, therefore I can spell and write a best selling book”. Shopping by price alone means that you will no doubt be getting less… less of what it is that makes a diamond engagement ring look good. You will also possibly be getting less service, fewer guarantee’s, less quality in the workmanship, and no back up in the years to come. Diamond selection issues are compounded by a common misconception that the best deal is the lowest cost in any given grade. Then some try to get the biggest diamond possible ( by weight ) in that grade. It will likely be the lowest cost because it is the worst possible example of a diamond in every area, often poorer than the highest standard in the next grade down. 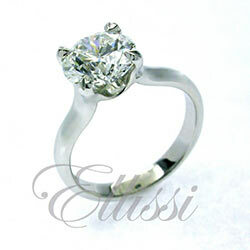 You will find some jewellers who are prepared to make engagement rings using diamonds supplied by clients. It is a risky business. Let’s hope they know what they are doing. Because if the diamond gets chipped or damaged, they are not covered in the price they have charged you for making the ring for the cost of replacing it. So who bears responsibility for the damage? And the completed engagement ring? Well time is money as they say and if the ring is not quite right, there is not much financial incentive in the job to make it worth the jeweller’s time and effort to get it right. It would be all time and great financial risk. Most competent jewellers wisely think it is better to leave well alone and not take on work using diamonds supplied by clients. Such jewellers don’t want to have any of the issues associated with dodgy diamonds. If the diamond selection is not carried out with ring design issues in mind, the completed engagement ring can have inherent problems for the rest of its life. In fact, in some engagement ring designs, it is crucial to have the correct diamond shape and cut. If these elements are not right, making the ring and setting the diamond can be extremely problematic. Setting diamonds into engagement rings is perhaps the most risky part of the whole job. One slip or miscalculation in the process and say goodbye to the diamond – it is history. In fact, chipping a diamond can easily be done in the setting process, even if the diamond were selected to be the exact correct shape for the ring design. Setting a diamond requires great skill. If a diamond setter tries to set a diamond that is just “not quite right” in some way, whether it be because it has dangerously positioned faults and inclusions, or simply because the diamond the has not been cut well, and has an odd or “lumpy” shape, the risk of damage is magnified tenfold, as the diamond is subjected to enormous pressure in the setting process. Dodgy diamonds that have a poor cut and a lumpy shape are very hard, if not impossible to get to sit correctly in the setting. It doesn’t matter how highly skilled the diamond setter is, they can only work with the materials they are given. And an odd shaped diamond is an odd shaped diamond. It may never look straight in the ring simply because the diamond was never right in the first place. Finding a competent jeweller to put the nuts and bolts of an engagement ring together is generally the best plan, although this is not as easy as you might think. The best jewellers carry out great work. They select the best diamond they can for their client’s budget, and make a quality ring. A great looking engagement ring is the end result. You will find that such jewellers are not interested in taking on the making of just a ring mount for a diamond purchased elsewhere. This is because they take on all the risks and the potential problems in diamond selection are not under their control. If you think the engagement rings on this website look really good – you are right – they are. This is because we are really, really careful in our selection of diamonds for clients. This does not make our engagement rings more expensive. We simply use our knowledge and expertise to select the right diamond for the price and budget. We also have ultimate responsibility for the whole engagement ring, from supplying a good quality diamond to crafting a well made ring. Our reputation depends on this, which is why it is just as important to us to get it right, as it is to you.